Temple Did It and I Can Too! 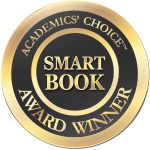 immediately captured the independent Academics’ “Choice Award” with its seal of excellence as a “Smart Book,” which is recognized worldwide by consumers and educational institutions as indicators of genuinely effective learning products that stimulate the mind and provide potential for students to succeed. As a child, Temple didn’t speak until she was four, because she was autistic. When she went to school, she was bullied, and people made fun of her. In the beautifully illustrated, hardcover book, she explains the seven simple life rules that helped her overcome her difficulties to make her not only a successful professor of animal science but a leading voice worldwide for the humane treatment of animals and those with autism or other disabilities. Temple says that the most important rule for a young child to learn is to work hard. When she was young, she spent hours outdoors trying to figure out how to fly her handmade small paper bird kites behind her bike. Although her homemade kites failed again and again, she kept trying. She says her mother was encouraging, but she never made the kites for her. “She wanted me to figure it out by myself,” she explains. She also tells children to follow their passions and learn everything about them. Temple’s passion was cattle, so she is now considered one of the world’s experts on cattle. She then expanded her knowledge into all other kinds of animals, including birds, horses, pigs, and many others, so she is the “go to” person about how to handle animals humanely. She’s done the same thing in learning about the human brain, finding out that many bright people think differently, like those on the autism spectrum. The award-winning book was illustrated by Lynda Farrington Wilson, recognized for her outstanding work in her own children’s books A.U.T.I.S.T.I.C? How Silly Is That? 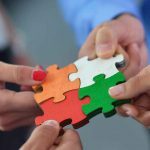 and Squirmy Wormy: How I Learned To Help Myself. 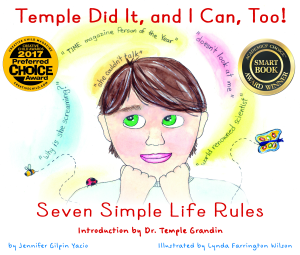 Temple Did It, and I Can Too can be purchased in leading book stores and online here at Future Horizons, Amazon, Barnes & Noble, and www.templegrandin.com.